The U.S. has stepped up efforts to battle forced labor in prisons overseas, and the move is spelling trouble for some Chinese companies. U.S. authorities have blocked imports they suspect were made with convict labor linked to three Chinese firms, detaining goods including chemicals, textile fibers and sweetener. The recent enforcement orders are the first since the U.S. closed a decades-old loophole in March. A trade law from 1930 had previously allowed goods "made with convict labor, forced labor or indentured labor" to be imported if they were in short supply. Prison labor has long been an ugly and opaque corner of China's giant manufacturing and trade sector. U.S. efforts to tackle the problem have run up against a lack of transparency and cooperation from the Chinese government. Closing the U.S. loophole, experts say, puts pressure on companies to pay more attention to the source of products they're buying. "It's a major driver for change," said Nadira Lamrad, a researcher at the City University of Hong Kong. "The U.S. is a huge market, so it can force corporations and manufacturers to think about the risks that exist within their supply chain." Two of the Chinese companies whose products were blocked -- Tangshan SunFar Silicon Company and Tangshan Sanyou Group -- could not be reached for comment on the matter. Multiple calls to numbers listed on the companies' websites went unanswered. In some cases, the lines were disconnected. A manager who answered the phone at the third company, Inner Mongolia Hengzheng Group Baoanzhao Agricultural and Trade, said it was "absolutely impossible" that it would have used convict laborers. He declined to be identified by name. Malaysia-based PureCircle, which imports the sweetener the U.S. detained at port last week, has denied that its goods were made by Hengzheng Group, noting that it has "an explicit policy prohibiting use of forced labor." The company says it is working with the U.S. government to try to get the shipments released. In 2014, China closed its "re-education through labor" camps, a system that human rights groups had criticized as a means to silence individuals the government deemed a threat, including political dissidents and activists. But human rights advocates and U.S. government officials say that they believe people are still forced to work under brutal conditions while locked up in government-administered detention facilities. "[It's] the use of state power to compel people to work ... [and] deprive them of their liberty," said Joshua Rozenzweig, an independent human rights researcher based in Hong Kong. The U.S. government continues to investigate allegations of forced labor in Chinese prisons, including claims of confiscated identity documents, and unregulated pay rates and work hours. "I haven't seen definitive proof one way or another that would convince me that this type of activity is not going on," said Kenneth Kennedy, a senior policy adviser with U.S. Immigration and Customs Enforcement. "The reports are still coming in, and they're credible. Just because the [Chinese] government says 'We're not doing this' is not enough to not have us move forward," he said. But finding witnesses of recent abuses in China's prison labor system is difficult. Inmates could still be in detention, and those who have been released often want to lay low, Kennedy said. In 1992, China signed a memorandum of understanding with the U.S. to prohibit the import of Chinese prison-made goods. The agreement also established terms to "promptly investigate" suspected violations of prison labor. It was expanded in 1994 to require both sides to allow government officials to visit suspected prison forced labor sites within 60 days of a request being made. The agreement was unusual in that the U.S. doesn't have such accords on prison forced labor with other countries. But it doesn't carry any penalties for failure to comply. China has taken as long as a decade to respond to U.S. requests for information, according to Kennedy. And Beijing has never made a request for information on American prison labor sites, he said. Neither China's Ministry of Justice, which operates the country's prisons, nor the Ministry of Foreign Affairs, responded to questions faxed by CNN. The Chinese government classifies most information about its prison system as state secrets. While estimates vary, it's clear the system is massive. The International Centre for Prison Studies in London estimates China has about 700 prisons with at least 2.3 million people in detention, while the Laogai Research Foundation, a U.S.-based nonprofit group, says there are 1,400 forced labor facilities of all types, holding 3 million people. 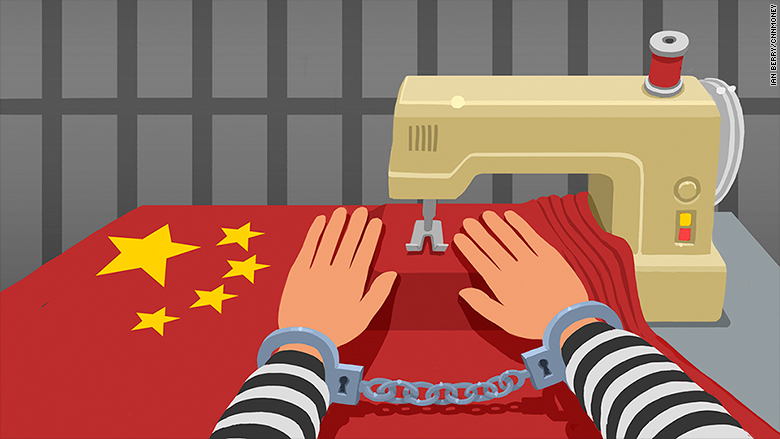 Some Chinese prisons operate sister businesses that "can essentially manufacture anything that the Chinese manufacturing sector is able to produce, whether that's apparel, toys, electronics, household goods," said William Nee of Amnesty International. The U.S. Department of Labor maintains a list of items from various countries that it suspects are the product of forced labor, which can occur in many different situations, including prisons. The items it lists from China include toys, clothes, shoes, electronics, bricks and even Christmas decorations. The Laogai Foundation also keeps a list that includes tea. Prison labor also happens in other countries, including the U.S. where inmates work through government contractors to produce goods for government and private sector use. The programs say they're aimed at preparing inmates for employment after their release. But they don't sit well with everyone. Some critics say conditions can be exploitative and inmates poorly paid. Private factory owners have complained that prison labor contractors have an unfair advantage because their labor costs are so low. Unicor, the government-run contractor for the federal system, typically pays inmates between 23 cents and $1.15 an hour, according to the Federal Bureau of Prisons. Unlike China, the U.S. doesn't deny that prison labor is taking place. Detainees are subject to a more transparent judicial process and review than in China, where the legal system can be opaque and confessions are sometimes coerced. But the global nature of modern supply chains often makes it difficult for U.S. authorities to identify whether a product was made by forced labor, Kennedy said. For example, various parts of one sneaker -- leather, shoelaces, eyelets, sole -- could each be made in different countries and in multiple factories. There's also "a lot of unauthorized subcontracting -- you give the order to a factory, but they give it to somebody else to complete," said Jeremy Prepscius, vice president for Asia Pacific at Business for Social Responsibility, a non-profit group that works with corporations. With China's labor costs on the rise, subcontracting is an increasingly appealing option, Lamrad said. Although China officially bans exports of goods made through prison labor, it's hard to know from the outside how that's being enforced. Plus, the U.S. has also only ever successfully prosecuted one Chinese company for importing forced labor goods into the U.S. -- and that was 15 years ago. "You can audit a factory," Rozenzweig said. "It's a lot more difficult to audit a prison in China."